I have just returned from a 7 day cruise of the Mediterranean on the Norwegian Epic. It was meant to be a family holiday this time, but my wife was ill at the last minute (she is getting better and I have to thank my daughter Louise for looking after her this week). We have insurance for her, but she insisted I went anyway, and so it was myself, daughter, her partner and his mum in two cabins. I'll do a more positive post on the holiday itself separately I expect. Herculaneum was interesting (and hot). This blog is about the problems, and gotchas for anyone planning such a cruise. Simply put the holiday is sold as "all inclusive" so that you have "simplicity and relaxation", the idea that an all inclusive holiday means you don't have to worry, or even budget for "tips", it is all included. In practice everything you do needs checking to see if included or not, all the time, and there are a maze of complicated and confusing exceptions and rules and mistakes making the cruise a serious of annoyances and arguments from start to finish. Nothing is "simple" or "relaxing" about the rules and exceptions you encounter all day and every day. The headline is simple. Always included are alcoholic beverages, soft drinks, bottled water, unrivald [sic] dining, entertainment, service charges, gratuities and more... Sounds perfect. What's more, Premium All Inclusive is now included in your cruise fare, so not some optional extra. That is even better. 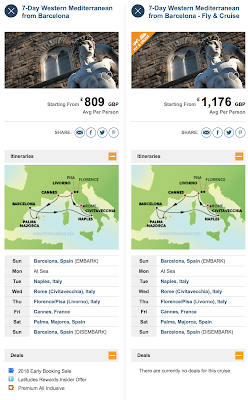 One is "7-Day Western Mediterranean from Barcelona" and one is "7-Day Western Mediterranean from Barcelona - Fly & Cruise". You would expect the difference is "Fly", i.e. the latter is more expensive and includes flight and transfer, simple. This is presumably what Thomas Cook thought. The prices are different, yes... Starting from £809 for the cruise, and starting from £1,176 for the fly+cruise. That is £367 per person for flight and transfer which is a lot. But spot the other difference, the cruise has "specials" including "Premium All Inclusive". Yes, that thing that is "included in your cruise fair" seems not to be included in your cruise fair on the more expensive fly+cruise package. What the hell? I really think Thomas Cook should have advised us properly - clearly if we want the best package, then this is not it. Indeed, it would be a better package, and cheaper, if Thomas Cook had also booked us flights and taxi transfer. That would also have been much more flexible, allowing a better seat on the plane, and a taxi that met us. As it was - departing we had to wait nearly an hour in a hot and humid airport for our transfer bus, and returning the transfer bus meant leaving at 6am and waiting nearly 5 hours in the airport. Yes, last week there was some strike, but not this week, and if we had a taxi we could have changed it and not had to be up at 5am (4am UK time) on our last day! Even so, it does not excuse the fact that NCL state clearly that Premium All Inclusive is included in the price of the cruise. I really think we need to get Trading Standards to look at the whole thing. Our first real clue to this was when we got the confirmation. Oddly, we did have several of the parts of the Premium All Inclusive, but not quite all. Spotting what is missing is hard as you don't know what is itemised normally. However, we did spot that in my cabin, only two people had the "Ultimate Dining Package" and "Ultimate Beverage Package". Why is that even an option? Why would one person not have things (especially if they are "included in the cruise fare")? Thomas Cook said NCL had made a mistake and NCL said Thomas Cook had booked it wrong, and we told them to just sort it, so the new confirmation showed the extra package for Mikey's mum. Yay! Now, we know this because my mate Mike was sneaky and booked his family holiday as the 7-Day Western Mediterranean from Rome, and surprised me by being on the next table in the restaurant when we were docked at Rome! He had kept it quiet for months. It was a great surprise and we then joined him and his family for various meals and activities until we left today. Nice to see Mike and his family again and a nice surprise. Mike had two adults and two children in the 2 bedroom cabin, but he had 28 bottles of water in the cabin at the start. 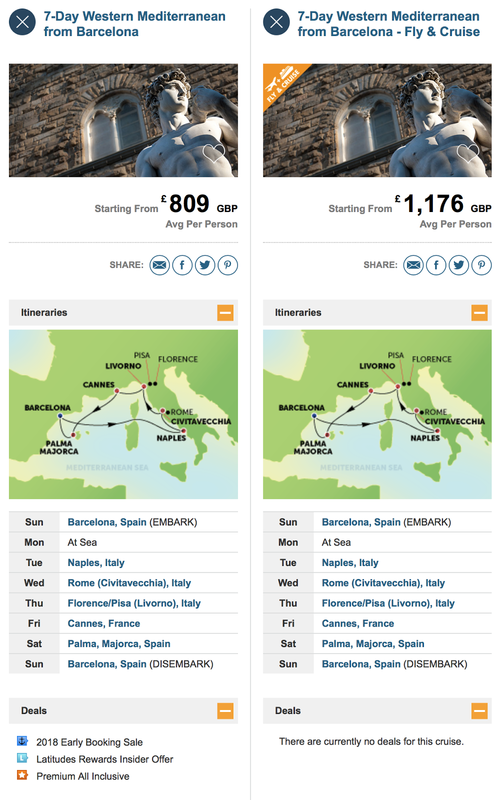 The difference is he booked flights separately (and more cheaply) so just got the cruise not the "fly+cruise". However, even he found that bottled water is not in fact "always included", in spite of that very clear headline on the web page. They even try and trick you when you go for a meal as they start by saying "Would you like still or sparkling water?" - both choices are an extra charge, you need to ask for the tap water (which, in ship, is good quality water). Other than the water in the room, all bottled water is charged - very misleading! It does seem a very strange restriction as you can drink as much alcohol as you like, but not bottled water. Why do that if not just to annoy people? This brings me to the next restrictions which are even more confusing. Some coffee is included, it seems, not sure if included anyway or included in the "Ultimate Beverage Package", but not charged. E.g. my pot of coffee with my breakfast. But Mike's son got a coffee from one of the various outlets on the ship, and was charged! This is because "Specialty coffee" is not included! Except, apparently, it is, when having a meal in the restaurant! It gets worse, Mike's cards all have "UBP" (Ultimate Beverage Package) and "+C+J". He asked what he "C" and "J" are and was told "Coffee" and "Juice". OK, so why charge for coffee? Well no, even the "Coffee" add on to "UBP" does not include specialty coffee?!? We are left wondering how many types of coffee there are and what coffee exists that is not in "UBP" but is in "C"? The problem is, if you go to pretty much anywhere on the ship that serves coffee and ask for a coffee, what you get is apparently a "specialty coffee" which costs extra. There is one extra coffee type - the room has a coffee machine with pods of coffee, which I know are expensive normally. Mike did not use it for fear it would be another charge and another argument. From what I can tell that is included! Oh, and "J" for "Juice" does not cover freshly squeezed juice. But juice out of the plastic bottle is included in the "UBP", so again, what juice exists that is not in "UBP" but needs "J" add on? 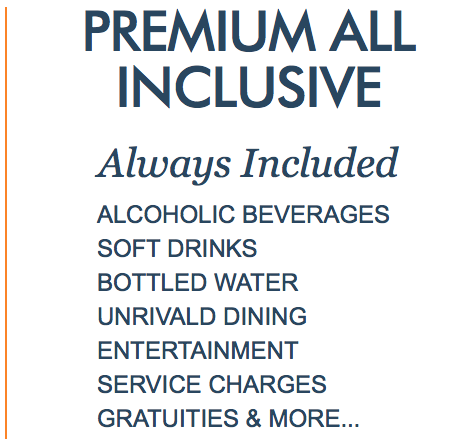 The "Ultimate Beverage Package" covers alcoholic drinks, and these are "always included" according to the headline on "Premium All Inclusive". Well, sort of.. The main rule is drinks up to £15 per drink. It seems an odd rule - if I want a shot of a 12 year aged whisky I would pay the extra $1.75 as it over $15. But I could drink Southern Comfort all night for no charge. I suppose it does discourage people ordering bottles of wine and bottles of whisky so maybe not that daft. Most drinks and cocktails are below the $15 so not really an issue, but odd. If that was the only rule, it would make sense, but as I say, the bottled water, and the coffee (unless with a meal) is excluded, and so is freshly squeezed orange juice, but also, it seems, cans of soft drinks like pepsi and red bull are excluded too. We started to wonder if they make it up as they go along! More confusing was when the cans were allowed as the mixer tap was playing up! OK, so we have some clue on this, what of the mini bar? We established that the self service coffee in the room is included, and the mini bar has small alcoholic drinks under $15 which would be included if we went to the bar and got them, so that is included, right? Wrong! The mini bar is charged. Yes, you can go to the bar and get a drink for free (included) but not to the mini bar! OK, what of sending the butler to get drinks. He can take the room card and get them and bring to room. Well, no, apparently that is not allowed either. The butler is not charged for (as part of Haven) but the drink is! This led to some concern when the the Haven lounge, playing cards, nowhere near the bar... One of the bar staff found us and asked if we wanted a drink. They took the card to the bar, got drinks, and brought it all back. Apparently that is included. But the butler doing the same (and from some rooms that is a shorter walk), it not included?!?! To top it off, Mikey's mum got stung for drinks because her room card does not say "UBP" on it. Now, we got Thomas Cook and NCL to add that for her, so it should be on the card, but the bar staff were adamant, and charged her! It was the last night and I was sick of this. We had not had issues with meals and no "UDP" on her card, oddly. The other thing that is part of the "Premium All Inclusive" is the meals. [Update: Reading the terms the specialty restaurants is part of Haven, not the Premium All Inclusive] Well, the whole ship has a lot of restaurants, and many are just included for all guests. Haven has one just for Haven guests and that is included. But there are "specialty restaurants" that charge extra. We had "3UDP" on the card, which is three meals in speciality restaurants. Why three? There are a lot of restaurants, and if they were simply all included we may try a different one each day, and quite possibly would only use three in specialty restaurants. But by limiting it, we had to plan things and think of things. It was Mikey's birthday and we decided to go to one of the specialty restaurants for that. This meant that 8 people were now planning dinners to ensure they had one of the three inclusive meals left for that day. You had to think about stuff and plan instead of relaxing. The other quirk was when Mike joined the ship. He did have the "Premium All Inclusive", clearly (he has the water!). Now, he was wary from the start (after being on the last cruise with NCL), so asked the concierge to explain it all. The concierge explained the drinks (though not all of the restrictions by far) and the meals and that it was three specialty meals, but that did not include the kids. He said it is only two per cabin. Well, oddly enough, that is what we had - why is that even an option NCL? Mike was not amused, and the kids heard this, so when the kids were not there he ended up spending a long time arguing it with the concierge - how stupid is it that they don't get to go eat a meal with the kids, or more to the point that the kids now felt they did not want to eat in those restaurants as it meant running up a bill for dad! The concierge basically said he could not fix that, he did comp a show (remember, "Premium All Inclusive" always includes "Entertainment", but shows somehow cost extra!). However, he then realised that the kids did have "3UDP" on their cards, so the concierge had basically lied when he said it was only two per room. OK, maybe not intentionally lied, but it shows that even the person working on the ship helping guests does not have a clue how the crazy system works on NCL ships! 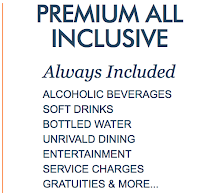 Update: It occurred to me, the "Premium All Inclusive" is "Always included: Unrivald [sic] Dining". From what I can gather this does not include the specialty restaurants, they was because of Haven. But surely the "standard restaurants" are at lease "rivalled" by the "specialty restaurants"? Otherwise, how are they "specialty" or worth more money. That means the claim of unrivalled dining is not true. When you get to the end of the cruise you leave the ship in the morning. People are put in different colour bands, and have luggage tags. The Haven have "gold" tags for priority. What priority means is the luggage is all lined up in an area of the dock before you get off, and you can quickly find your own. At Barcelona, anything but priority meant the luggage carousel like an airport, and lot of waiting even when you are the first "colour". There is another option! We found this on last cruise, but it apparently is on all of them: "Easy walk off". You just take your luggage with you and leave. You have flexibility of when to leave and you don't have to go hunting for your luggage. Even better, you don't have to pack everything but one set of clothes, toothbrush, tooth paste, shampoo, medications, phone charger, in the bag the night before and then carry all of that with you when leaving. I packed my marmite so did not have any on my breakfast, idiot! In this case, as we had the transfer to airport, we were told we had to be on the "red" tags, which are 6am. The Butler confirmed that the gold tags could not be used as they were 6:30am and the bus would have left. He did not even mention "easy walk off". In the morning, what actually happened, is before 6am was "easy walk off" only, i.e. no luggage was in the dock yet. We could have done that had we known! At 6am they called "Priority" (the gold tags) first. The priority luggage was all there on the dock and easy to find - we'd have seen our bags clearly as we came down the escalator if we had used the gold tags. Eventually at 6:05am they called "red", which we found was on the "blue" carousel (well planned there) and we had to wait ages for it. As I said, the transfer being so early meant nearly 5 hours waiting in the airport after a stupidly early start. Had we booked a taxi and our own flights it would have been cheaper and simpler by far. Basically, never book a fly+cruise with NCL - it costs more - is more hassle - and has fewer inclusive benefits. [update, added this section] One other thing worth mentioning - they charged 21% VAT even when at sea, which is odd, but did not seem subject to other EU laws such as the price tags showing VAT inclusive, and sale prices actually having been sold at full price at some point, or even that you cannot have an "all sales final, no refunds" policy. But even the discounting was devious and meant to catch you out. They started with 40% off the ticket price, so I suggested it was still a bit much, and she said, OK I'll give you another 10%. But I saw what she did with the calculator - took of 40% then too off 10%, so total discount was 46% not the implied 50%. That would fool a lot of people too, and the fact she then added the VAT before showing the total makes it less obvious that it is not 50% of the ticket price now. She actually went one step further to convert to £ from $ to make it even less obvious what she had done. One of the reasons it was extra confusing for Mike and I is that we did the Norwegian Jade, and there the rules did not seem to matter. This was because we were in the 3 bedroom garden villa - one of three premium suites on the ship - the previous week our suite had Priscilla Presley, apparently! Not only did the butler get drinks (apparently he knew which bar staff were happy to accept him as just getting them as us), we even had one case when in the Haven lounge where I sent him for a bottle of Southern Comfort and he managed that with no charge! The fact that sometimes the rules do not matter makes it even harder to know what rules there are and when you will be ripped off! Quick one on internet. The web site is clearer that it is 250 minutes you get now, it used to use words like "unlimited". So, well done NCL on that. On the ship it said if you have 250 minutes you can upgrade to all week (rather than 2% of the week) for only $85. I tried. I was charged the full $205. It turns out that even though the 250 minutes is per cabin, they put it against my wife's name, and when she did not show they cancelled it (no refunds). It took three days and a lot of nagging to get that fixed. It is also filtered like hell, and simply ssh did not work, even on alternative ports. L2TP worked though, and allowed me to have a working Internet connection and even IPv6 whilst at sea. It was 750ms base latency (satellite), dropping to 250ms in some ports (tunnel via US on land connection). Mostly very usable, but occasional peak load and 30s latency some of the time. Update: I forgot to mention another scam - if you have the NCL concierge app, it shows you have a "message". To read it you can pay $9.99 for intra ship messaging - it allows you to message others in your party - presumably each person pays. I assume it is a "welcome" message. What makes this a con is that iMessage (text, not media) works when on ship anyway (presumably as the NCL app needs apple push messages) so if you have iPhones you do not need the intra ship messaging service anyway! It is worth making a simple summary of the actual issues here. Booking an expensive "Premium All Inclusive" holiday, especially with kids like Mike did, should be hassle free, indeed "simple and relaxing". They can go get drinks, and food, and do what they like, you all can, with no having to think about money or hassle or rules. By having all these incomprehensible exceptions and rules, and even daft things like the meal thing being only three meals, you have to plan, ask every time what is included, and look out for catches constantly. That is what can easily ruin a cruise, and stop the repeat business they should be wanting. It seems they'd be better off dropping all the language about 'inclusive' and straight up charging for everything. Would probably save a bunch of admin work too. I don't see the point in trying to hook people with offers like that then put so many strings on them they're effectively useless - those customers will never come back, and neither will any of their friends. In many ways I agree, if all things are charged, we know there will be a big bill, and can see as we go, but expect it. Then - it is easy. It is this half way house that is the issue - most things, maybe all if you ask every time, are inclusive, but lots of rules and gotchas. I went on a South of France river cruise down the Saone and Rhone with Scenic this summer. It really was all inclusive, I paid for nothing on the ship and I drank far more alcohol than I normally do due to all the gorgeous wines. The only thing that would have been extra was getting more than one lot of laundry done, and that was very clearly explained. Given I packed enough clothes to need no laundry done, that wasn't an issue. And yes it really was relaxing being on a genuinely all inclusive river cruise. Nothing to worry about. I was away for 13 days and I spent about €150, all of which was off the ship on coffees, wine to take home and similar. It will be a snowy day in hell you'll find me trapped with thousands of others on a cruise ship, but it sounds like Norwegian is definitely one to avoid for their anti-customer policies. Of course, when you look at that headline on the front page saying "Always included: bottled water" how would you possibly think it is not included?! Madness. I've been to a few business networking events/parties. Wine and beer - all included. Orange juice which, per ml, or per glass/serving must be cheaper? Got to pay for that. Only the alcoholic drinks are inclusive. Any tips on what hardware to take to get a real internet connection onboard ? Excluding the 6* all inclusive luxury lines, the best cruise line IMO would be Celebrity X. Their drinks and dining packages are simple and without any tricks. Food and service great, lovely ships and just feels very premium. If travelling with kids then Royal Caribbean may be better as they have so much for kids to do as well as the adults! (Bigger the ship the better). They also have simple drink and dining packages with no tricks or silly exclusions. No real issues with the last few days, in fact it's been quite relaxing, except one coffee problem at breakfast, and red Bull is not covered but Mountain Dew is? Anyway just as we are about to leave I decide to buy some photos. I go for a package, mental money but still. So it clearly says $149.99 + vat for 20 photos including a USB. They do some slight of hand scanning every photo and then applying a lot of discount ( all theater as far as I can see ), then on an separate reciept, they charge the $149.99 + Vat but for some reason add in $19.99 JPG charge ( no mention of this anywhere) then a further 19.99 discount. The end result is the same, but the receipt looks odd because of the extra 19.99 especially as the the tax and the discount are in another section. When I questioned the charge I was first told it was the tax, then that it was discount. It maybe theatre, it may be for operational reason, or even for tax reasons but after a week I am tired of looking over my shoulder all the time for what the next catch is. It's a shame these stupid little thing are giving completely the wrong impression for what should be a fun and relaxing week. It's important to understand that none of this is about the money, I have tipped more that I could possibly have been caught for with any of these things. I just want to relax and pay a fair price. I hope this won't be my last cruise, overall NCL are very good, but I think I need another holiday to get over this one.